In many aspects of life where we need to use our brain power, we also tend to sit down: at school, at work, sitting exams or concentrating on a crossword. In a new paper, we explore how prolonged sitting may affect the brain’s fuel supply and have a negative impact on brain health. The brain is a glucose hungry organ. It weighs about 2% of body mass but demands about 20% of our resting energy requirements, which is mostly in the form of glucose, the primary brain fuel. If this energy supply is disrupted it can impair and even damage brain cells. Therefore, the availability of glucose to brain cells may have implications for brain health. Exposure of the brain to both high glucose levels and low glucose levels can increase the risk of developing dementia. Also, switching between a high and low glucose level, known as glucose variability, is important, as higher glucose variability has been associated with lower cognitive function. This indicates that tight control of glucose is essential for brain health. Too much sitting can increase the risk of early death. It’s estimated that 60-75 minutes a day of moderate to vigorous intensity exercise is required to offset the increased risk of death associated with more than eight hours a day of sitting. This is a lot of exercise. At least twice as much as the current minimum recommended amount for adults. So reducing sitting may be an additional health-enhancing strategy. Multiple studies have demonstrated that reducing and replacing sitting with light intensity walking improves glucose control after food consumption. That means glucose levels that do not spike too high, or dip too low. This may be explained by the way working muscles can use up some of the glucose in our system, helping to keep glucose in the optimal range. 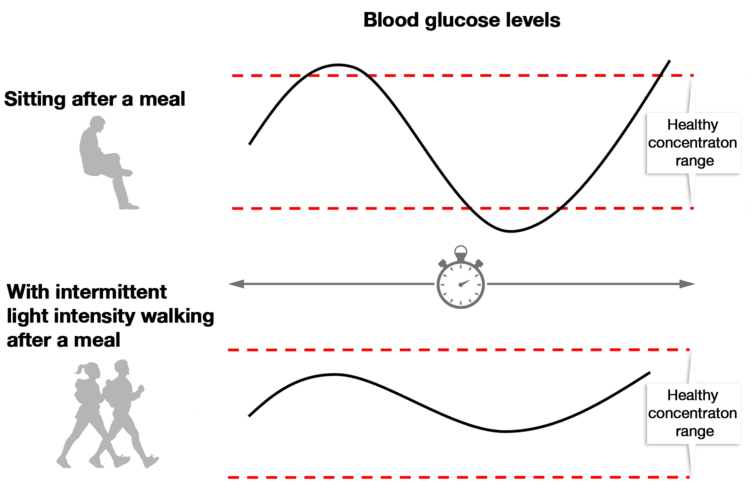 Evidence suggests that when it comes to glucose control, light intensity physical activity spread across the day can be superior to a day in which a single bout of moderate to vigorous exercise is performed in the morning. Even when the total energy expenditure of the light intensity activity is equal to the energy expenditure of the single bout of higher intensity activity. Improved glucose control may explain some of the health benefits of reducing sitting time, but what about effects on brain function? Studies investigating the effects of excessive sitting on brain function have had mixed results. Laboratory studies both support and fail to support, the idea that a day of sitting can impair performance on memory related tasks, relative to a day where sitting is interrupted by regular activity breaks. Other types of studies that track a large number of people over a number of years suggest an association between higher sitting time and impaired brain function. But drawing conclusions from these studies is made difficult by the multitude of different measurements used. Generally, methods that do not rely on the self-reporting of participants are preferred, because self-reporting isn’t always accurate. This isn’t always practical though. Apart from directly measuring performance on cognitively demanding tasks, another approach is to measure something that would theoretically support improved brain function. For example, researchers at New Mexico Highlands University demonstrated that foot impact during walking sends pressure waves through blood vessels to increase brain blood flow. Brain blood flow is involved in regulating supply of glucose to the brain, and this likely has implications for brain health over time. For example, we know decreases in brain blood flow are associated with a more rapid decline in brain function in those with Alzheimer’s disease. For scientists, the way in which sitting is likely to affect brain function poses a research challenge. Based on the available evidence, it’s more likely that reducing sitting would slow cognitive decline, rather than improve cognitive function. For everyone else, despite a current lack of conclusive studies linking brain health and sitting, reducing sitting time is already advised to prevent other adverse health outcomes linked to poor glucose control. With improved glucose control in mind, reducing sitting is especially important after meals. So take a walk after lunch, wash the dishes by hand after dinner and take an active commute to and from work if possible. There is much opportunity to reduce sitting time throughout the day, and therefore much potential to have a positive impact on health. How much sleep do teenagers really need?